Affidavit Exclusive to ServeManager, Now Available in Your Account! 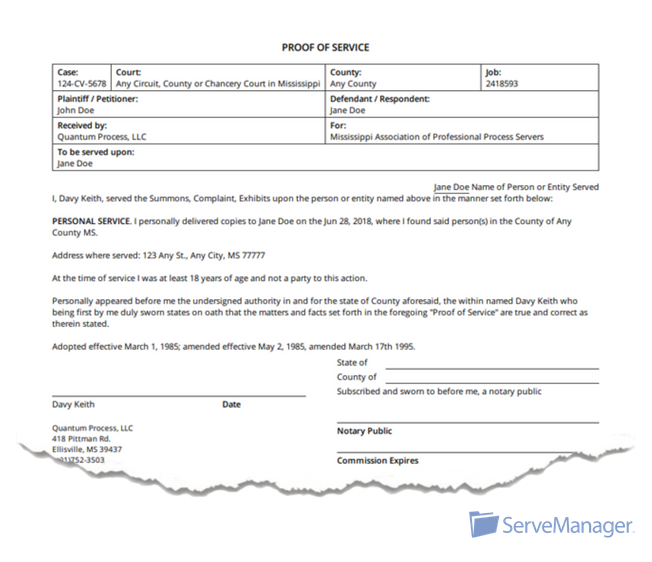 MAPPS founder, and ServeManager enthusiast, Davy Keith, designed a new affidavit that complies with all of Mississippi laws regarding process service. This affidavit is available exclusively in ServeManager so our members have access to the best affidavit available in Mississippi. The new MAPPS, (Mississippi Association of Professional Process Servers), approved affidavits resolve many issues surrounding the use of the affidavit stipulated in the Mississippi Rules of Procedure. The new forms allow for multiple documents to be listed, and lists the address where service was rendered, rather than only the address listed in the summons. The forms also prevent identity theft by removing individual servers' Social Security Numbers and personal address (no court in Mississippi requires this information on a Proof of Service). The MAPPS approved affidavits also comply with Rule 4 of the Mississippi Rules of Procedure regarding service of process. By separating the proof of service from the summons, we are giving users more security over their documents, while still abiding by the laws of Mississippi. These proofs of service were presented to the board members of MAPPS and were approved as the best proofs of service to use for Mississippi Circuit, County, and Chancery Court as they not only comply with the needed language offered on the approved form but also include additional information that allows the proof to be presented as a stand-alone document not required to be printed on the back of the summons served. MAPPS recommends that any service validly issued in any Mississippi Circuit, County, or Chancery Court use this approved form for all proofs of service served personally or with residence service. These affidavits are for ServeManager subscribers only. As with all ServeManager affidavits, the information you enter in your job and attempts can even populate on these affidavits. These affidavits are now available in every ServeManager account. To access them, create a new affidavit, and select the pull down menu from the top, you will find these affidavits in that list.